Asbury Woods presents the 22nd annual Winter Wonderland event, scheduled for December 14 through 16 and December 27 through 30 at the Andrew J. Conner Nature Center. 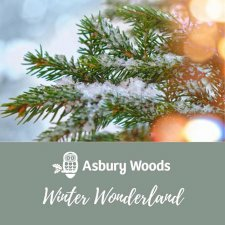 Experience the magic of the holiday season and the beauty of winter at Asbury Woods during Winter Wonderland. Get into the holiday spirit with a stroll along the boardwalk. This quarter mile path provides a twinkling journey where visitors can view the breathtaking sights of winter in the Woods along with a synchronized light show featuring holiday music. Warm-up with a sip of hot chocolate and s’mores by the bon-fire. Families can explore the Discovery Zone inside the Nature Center where hands-on science intersects with outdoor exploration. The holiday tradition of a model train display delight visitors of all ages. Dress warmly and discover wintry thrills with fun outdoor activities that encourages visitors to enjoy nature all year round. New for adults this year! Indulge in a sample of Knockin Noggin, a warm, spiked hot apple cider presented by Erie Beer Company. Samples served to adults 21 and over on Friday, December 14 and Friday, December 28. December 14 – 16 and December 27 – 30 from 6:00 p.m. to 9:00 p.m.
Tickets can be purchased at the door. All proceeds benefit Asbury Woods. Tickets are $5 for Asbury Woods members and $8 for non-members. Children 3 and under are free. Winter Wonderland is made possible through the following sponsors: National Fuel, First Energy Foundation, MacDonald Illig Attorneys, UPMC Health Plan, Walmart, Northwest, J. Thomas Tree Service and Visit Erie. The mission of Asbury Woods is to provide all members of the community with meaningful environmental, educational and recreational experiences that inspire a greater sense of environmental awareness, sustainability and stewardship. Asbury Woods achieves this mission through a diverse array of educational, environmental and recreational programming for schools, community groups, families and individuals of all ages. In addition, they manage and maintain 205 acres of preserved property which includes native species, old-growth forests, landscaped gardens, wetlands, boardwalk trails and dirt trails. The Andrew J. Conner Nature Center at Asbury Woods is the cornerstone of the educational programming, providing animal exhibits, a touch-and-learn Discovery Classroom and free public access. The Brown’s Farm Barn located on Sterrettania Road provides additional programming space for summer camps, school visits and community programs. The Greenway Trail at Asbury Woods consists of adjacent tracts of land which provides a network of trails connecting Browns Farm and the Nature Center. The Greenway Trail provides ample recreational opportunities for hiking, running, biking, skiing, snowshoeing and wading in Walnut Creek. Trail users will find peaceful spots to rest and relax to take in the serene vistas. Asbury Woods is an independent, non-profit organization whose mission is made possible by funding from program and service fees, grants, special events and generous donations from members and patrons. Annually, Asbury Woods positively impacts more than 100,000 people who use the trails, attend festivals or participate education and community outreach programs.